1.5 How to Apply for IBPS Specialist Officer Recruitment 2018/ CRP SPL VII? Good News!!! Institute of Banking Personnel Selection has released the IBPS Specialist Officer Notification 2017. Apply online for 1315 IBPS SO Jobs before the last date. The preliminary exam will be conducted on 30th and 31st December 2017. Here on this page, one can get the details of IBPS SO Vacancy 2018, Specialist Officer Exam date, IBPS CRP SP VII Application process, etc. Latest Update on 07/11/2017: IBPS SO Apply online link activated. Interested candidates can register for IBPS Specialist Officer CRP SPL VII exam from this page. Hurry up and complete the IBPS SO Registration before the link expires. The much-awaited IBPS SO CRP SPL VII Notification was released on 27th October 2017. As per this notification, a total of 1315 vacancies to be filled in various public sector banks and other participating organisations. This Latest IBPS SO Recruitment 2017 will be held for recruiting candidates to the posts of I.T. Officer (Scale-I), Agricultural Field Officer (Scale I), Rajbhasha Adhikari (Scale I), Law Officer (Scale I), HR/ Personnel Officer (Scale I) and Marketing Officer (Scale I). A total of 20 organisations will participate in the IBPS SO CRP VII for selecting candidates against these 1315 vacant posts. Some Lakhs of individuals who dream to get a job in the Banking sector will apply for the exam. So the candidates need to prepare brilliantly so that they can beat up their competitors and achieve the top scores in the exam. The IBPS SO 2017 Apply online link will be active from 7th November 2017. The officials will accept the applications upto 27th November 2017. 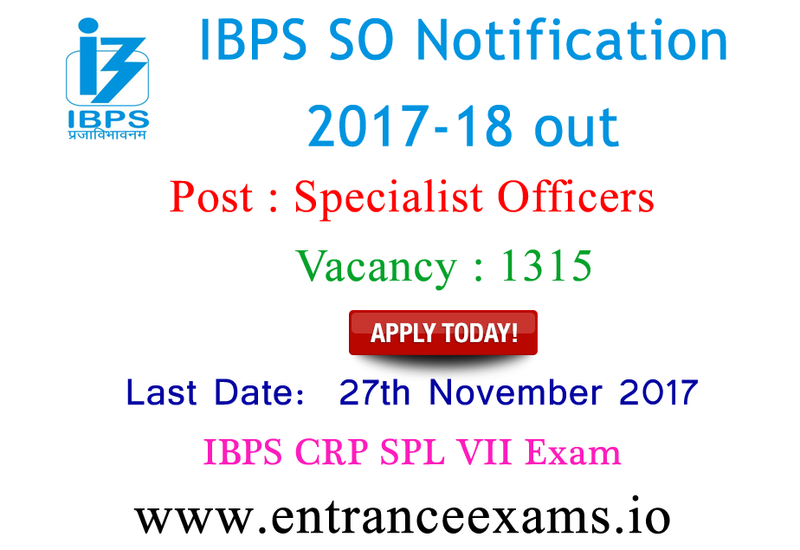 Hence interested candidates of IBPS CRP SPL VII Recruitment 2017 must submit the applications through the official website, i.e., www.ibps.in between these dates only. One can also apply for IBPS Specialist Officer Vacancy from this page. Before applying, all the candidates should make sure that they satisfy the eligibility criteria of IBPS SO CRP VII Notification. If you found you are eligible for this IBPS Specialist Officer Exam, then only fill the online application. If in case you are found ineligible, then the authorities will cancel your candidature. Hence I advice all the applicants to check the details of IBPS SO Eligibility Criteria 2017 thoroughly. The age limit of the candidates applying for IBPS Specialist Officer Notification 2017 must be between 20 years to 30 years as on 01/11/2017. That means you should not have been born before 02.11.1987 and not later than 01.11.1997. For I.T. Officer post: A 4 year Engineering Degree in Computer Science/ Computer Applications/ Electronics & Telecommunications/ Information Technology/ Electronics & Communication/ Electronics & Instrumentation OR Post Graduate Degree in Electronics/ Electronics & Telecommunication/ Electronics & Instrumentation/ Electronics & Communication/ Computer Science/ Information Technology/ Computer Applications. Rajbhasha Adhikari: Post Graduate Degree in Hindi with English as a subject at the degree level OR Post graduate degree in Sanskrit with English and Hindi as subjects at the graduation level. For Agricultural Field Officer: Aspirants must have done graduation degree in Agriculture/ Horticulture/ Veterinary Science/ Dairy Science/ Animal Husbandry/ Agri.Engineering/ Agri Marketing & Cooperation/ Fishery Science/ Pisciculture/ Co-operation & Banking/ Agro-Forestry. HR/Personnel Officer (Scale I): Graduate and Full time Post Graduate degree or Full time PG Diploma in Personnel Management/ Industrial Relations/ HR/ HRD/ Social Work/ Labour Law. For Law Officer (Scale I): A Bachelor Degree in Law (LLB) and also enrolled as an advocate with Bar Council. For Marketing Officer: Graduate & Full time MBA (Marketing)/ Full-time 2 years PGDBA / PGDBM with specialization in Marketing. Candidates applying for IBPS SO Notification 2017-18 need to pay the application fee as per your category in online mode. General (Unreserved category): Rs. 600/-. SC/ ST/ PWD category: Rs. 100/-. Starting date of IBPS SO Online Application: 07th November 2017. End date Of CRP SPL VII Specialist officer Online Application: 27th November 2017. Date of Online Payment of Application Fees: 07/11/2017 to 27/11/2017. Download of Call letter for Online examination (Preliminary): December 2017. IBPS Specialist Officer Preliminary Exam Date: 30th and 31st December 2017. Declaration of IBPS SO Prelims Result: January 2018. Download of ibps.in Specialist Officer Main Exam Call Letter: January 2018. Mains Examination date: 28th January 2018. Declaration of IBPS SO Mains Exam Result: February 2018. Download of call letters for interview: February 2018. Conduct of interview: February 2018. How to Apply for IBPS Specialist Officer Recruitment 2018/ CRP SPL VII? At first, login to the official website, i.e., www.ibps.in or direct link given below. Click on CWE Specialist Officers section available on the left side of the homepage. Navigate to Common Recruitment Process for Specialist Officers link. Now click the IBPS SO 7 Apply online link. Login with those credentials and fill the further details in the IBPS Specialist Officer Online Application. Verify all the details thoroughly and then submit the IBPS SO CRP SPL VII Application form. Finally, take a print out of the application form for future use. This is all about IBPS SO Notification. If you have any doubts, you may ask us in the below comment section. Also, stay tuned for our www.entranceexams.io site to know more details about all Entrance Exams, State Govt, and Central Government Jobs in India.